Himachal Pradesh has always stunned all the travellers with its natural wonders. Breezy cool weather, green hills, dazzling lakes, soothing rivers and charming rivulets has made Himachal Pradesh one of the most sought-after summer destinations and a favourite hub amongst nature lovers and honeymooners. However, the exuberant natural beauty of this enchanting state has somehow overshadowed many other aspects of the state which are equally marvellous. One such factor often missed out by the travellers is its rich culture and history. So, how about taking a dip into an unexplored world of historical wonders in Himachal amidst natural glamour this season? One place that you must visit if you are looking for history in this hilly state is Kunihar, a hidden valley town which dates back to several centuries. Read on to know more about this beautiful yet untouched town. As Kunihar maintains a pleasant environment and favourable climate throughout the year, it is a year-round destination. However, the best time to visit this hidden valley town is from September until the end of March. 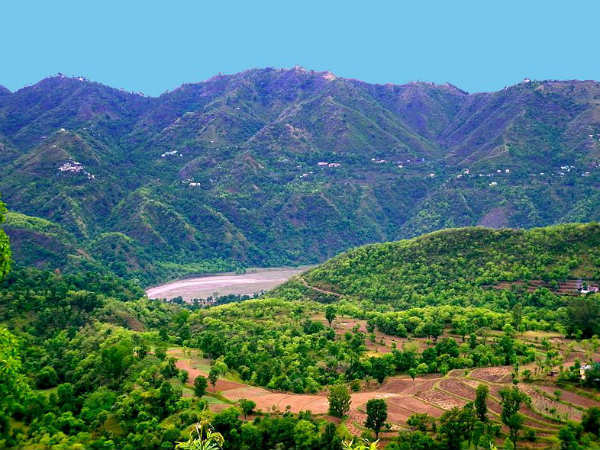 Located in the Solan district of Himachal Pradesh at a distance of about 40 km from Shimla, Kunihar is a historical town that has derived its name from a garland shaped rivulet, Kuni, which flows through the valley. Other names for this historical valley town are Hatkot and Choti Valley. As per ancient records, it was founded by a Raghubansi Rajput named, Abhoj Dev, in the 12th century. His descendants ruled the town for many centuries until the independence in the year 1947 and adopted the title Thakur. However, it was under the control of Nepal for a short period of time, i.e., from 1803 to 1815. Today, Kunihar is a tourist destination for offbeat travellers and is a perfect spot to learn about the history of Himachal Pradesh. On account of the presence of beautiful hills, deep valleys and rich vegetation, it makes for an ideal summer destination too. Untouched by the fast-paced city life, the town of Kunihar remains embedded within its ancient glory. Even though most of the monuments you find in Kunihar are in ruins, you can still catch a glimpse of a glamorous past it had. It is at the site of these ruins you can understand the true Indian history. Besides the rich history of Kunihar, one can also go for peaceful nature walks in the hills, trek up its unexplored trails or simply enjoy the serenity of nature by the Kuni river. So, if you want to enjoy a beautiful mix of history and nature in Himachal Pradesh, then Kunihar is a place you must visit. By Air: The nearest airport from Kunihar is located in Shimla at a distance of about 28 km. Once you have reached the airport, you can hire a direct cab to Kunihar. It will take an average time of 1 h to reach your destination from the airport. By Rail: The best way to reach Kunihar by rail is to take a direct train to Chandigarh railway station which is located at a distance of about 75 km. From the station, you can get a direct cab to Kunihar. By Road: Kunihar has a good road connectivity and hence, it can be easily approached by road.